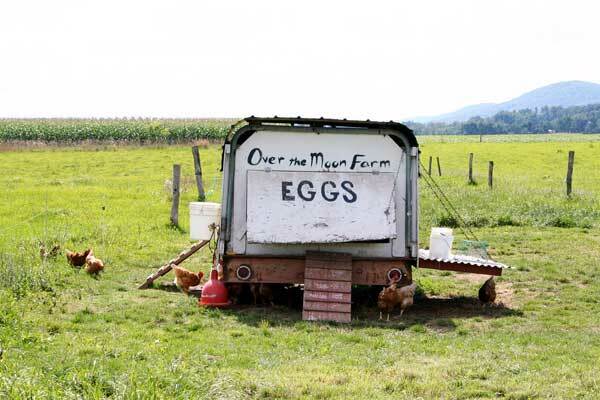 Over the Moon Farm, Rebersburg. Photo Credit Emily Wiley. Enjoy a tasty meal from a neighborhood restaurant that uses fresh, local ingredients in their menus. Try chicken wings with Tait Farm Teriyaki sauce at Elk Creek Café + Aleworks in Millheim. Break bread from Gemelli Bakers at Harrison’s Wine Grill in State College. Or bite into a juicy burger made from pasture-raised meet at Otto’s Pub and Brewery in State College. Visit local farms like Way Fruit Farm in Port Matilda, Harner Farm in State College, or Clan Stewart Farm in Huntingdon. Pick from an array of fresh fruit, vegetables, and meat. Go to a farmers market and choose from a selection of produce, homemade baked goods and pastas, jams and salsas, and more. Visit Buy Fresh Buy Local for a full list of local markets and hours of operation. Join a CSA. Community Supported Agriculture (CSA) programs allow you a weekly box full of goodies provided by local farms. Find CSAs at Local Harvest. Do it yourself. Get your hands dirty and plant your own garden. Till your own plot, or simply use pots and place them on your porch. Either way, you will enjoy the fruits of your own labor! So it’s time to put down that McDonald’s hamburger, close the Doritos, and hide the Oreos. Who needs those manufactured foods when you can enjoy a healthy, delicious chicken breast from Cow-A-Hen Farms in Mifflinburg, or a succulent and sweet corn on the cob from Ardry Farms in Howard, or a homemade blueberry cobbler purchased at the State College Farmers Market? How do you support local food? Bio: I am a senior at Penn State majoring in Journalism, French, and International Studies. This summer I will be working on the local foods blog. I couldn’t have picked a better topic considering this blog is a mix of two of my favorite things: the environment and food.